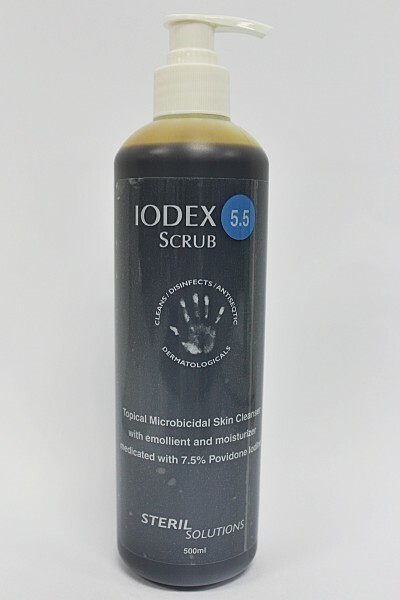 IODEX is an antimicrobial hand wash containing Povidone iodine (PV P-I) 7.5%, an active ingredient which is effective against a broad spectrum of transient and resident micro-organisms on the skin of the hands, forearms and the rest of the body. Immediately lethal to transient bacteria on the skin and has prolonged residual protection against resident bacteria. IODEX is supplied in a 500ml bottle with a dispenser that controls wastage by releasing only 1ml of solution with every pump and preventing subsequent spout drip. Recommended for use in high-risk areas. SKU: HUN 00 00 05. Category: STERIL Solutions.